This army was built to be a fun army and with spare time. The zombies are used as plaguebearers, and are from "Heresy Miniatures." The Blood Thirster is a Forge World Daemon Prince with LotR Balrog wings. The Tzeentch Daemon Princes are from Privateer Press. 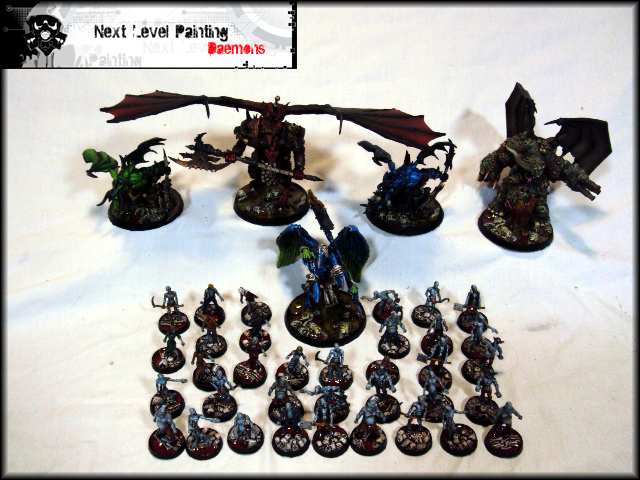 The bases on the models come from "Secret Weapon Miniatures" "corpse field" and "skeleton field" bases with GW "water effects"
Which wings did you use for the Khorne demon?